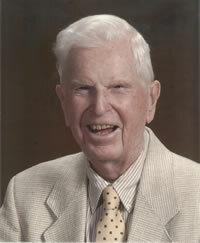 Stuart F. Dufour (1913-2007) went to San Mateo Community College before attending Stanford University. He always felt that his years at the community college were a key to his admission at Stanford and always had high appreciation for the junior college system. At Stanford he majored in Communication and, upon graduation in 1934, got a job as a reporter for the San Jose Mercury Herald. It was there that he met his wife, Willna, also a reporter at the Mercury. They were married in 1936 and had two children. In 1939 they moved to Salinas where he taught journalism and history at Salinas Union High School. After serving with the American Red Cross during the war, he came back to Salinas Union High School. In 1946 Stuart came to Hartnell as a journalism instructor and worked at the college with Dr. Ching from1951 until he was selected to be junior college president in 1955. He was popular among both students and faculty. After retirement in 1968, he and Willna enjoyed travel, golf and investing their savings in the stock market. Many of their investments were successful, enabling them to establish a charitable trust with proceeds given to Hartnell, Stanford, and the Salinas Valley Memorial Hospital.